Artist impression of the RM800mil Sejati Residences project that will be developed by Paramount on 50 acres. Paramount Property Development Sdn Bhd has launched its most up-market residential development in Cyberjaya, Selangor, last month to kick off its move up the value chain and rebranding exercise. 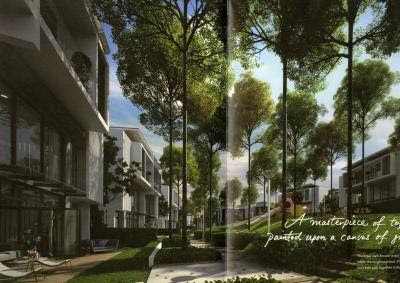 Known as Sejati Residences, the 50-acre development is located in mukim of Dengkil, Sepang. A total of 40 acres will house 249 landed units comprising superlink terraced housing, three-storey semi-detached homes and bungalows. The three-storey bungalows will come with lifts. Its three-storey superlinks will have built-up area of about 3,800 sq ft, semi-detached units between 4,300 and 4,900 sq ft and three-storey bungalows from 5,700 to 5,900 sq ft. The bungalows will come with lifts, which will mean convenience, at a cost. Liew says Paramount's objective is to build multi-generation homes. Seventy-eight units of landed units were launched late last month. The remaining 10 acres will be reserved for a condominium project, with the first phase having 414 units. There will be three phases. The project will have a gross development value of about RM800mil and will be the most high-end project ever undertaken by Paramount. Considering the scarcity of land in the Klang Valley and the size of land which seems to be getting smaller today, Liew says the company has to move up the value chain and go into the high end of the property market. The freehold project will come with a 11,000-sq-ft clubhouse and facilities like function hall, surau and pool. Liew says there will also be an 8km jogging track in the former oil palm plantation land. Adjacent to it is Symphony Hills by UEM Land Holdings Bhd, that was launched last year. Liew says growth in Cyberjaya will be organic while Putrajaya will remain the administrative centre with a large civil service force and there will be demand for landed units as the city grows. Conceptualised 15 years ago to complement Putrajaya, currently, most of the residential units in Cyberjaya are high-rise condominiums and apartments. A number of developers have projects there. They include Emkay group, Mah Sing Group Bhd and OSK group. Mah Sing also offers landed residentials there. Sixteen major developers are expected to invest up to RM20bil in Cyberjaya over the next five years. They include SP Setia Bhd, Mah Sing, Nadayu Bhd, UEM Land, Glomac Bhd, OSK Property Bhd and MCT Consortium. The move out to Cyberjaya and other locations outside Kuala Lumpur is a natural progression. As the Klang Valley becomes crowded and prices of landed residentials become more prohibitive, there will be demand for landed units in new locations like Cyberjaya, agents who are marketing projects there say. Added to this fact is the requirement by house buyers today for security. While there is a certain amount of security in condominiums, there will be a group of high-end buyers who would want to stay in secured landed units with a greater preference for semi-detached and bungalow units. It is this group of buyers that developers like Paramount, UEM Land, Mah Sing group and Suntrack Development Sdn Bhd are targeting. Suntrack's SummerGlades fronts the Putrajaya Lake and commercial retail project but only has superlink terraces. Symphony Hills and Sejati Residences offer three types of landed units but do not have the commercial retail element. Both developers will be offering contemporary designs with linear parks and landscaped gardens. There is a national-type school near Sejati Residences and Symphony Hills. In that respect, the competition will be between Symphony Hills and Sejati Residences for now. Depending on the design and type, the first phase of Symphony Hills was launched at about RM370 per sq ft last year versus Sejati Residences' superlink at RM368 per sq ft last month. The smallest built-up at Symphony Hills is more than 3,200 sq ft. Prices on a per sq ft basis may exceed RM500 in some cases for the larger units. Sejati Residences' land size of about 50 acres is about half of Symphony Hills' 98 acres. While Paramount has reserved 40 acres out of 50 acres to cater for 250 landed residentials and carved out 10 acres for its condominium project, UEM Land has also reserved nine acres for its condominium project which will comprise two blocks of 44 and 45 storeys each to house more than 800 units. Sejati Residences will also have its condominium project of 700 units. Liew says Sejati Residences' condominium will have separate entrance and exit from the landed units. It will also have its own clubhouse. That means the density ratio for its landed units will be six to an acre. Over at Symphony Hills, its condominium project will be located on the northern fringe but will share the same internal roads, entrance and exit as the landed units. The differentiating factors will be the reputation of the developers, the density of the project and the mix of high-rise units with landed residentials, landscaping and facilities provided and the details. At the moment, the maintenance charges at Sejati Residences is fixed with indicative monthly fee set at RM280 per unit for superlinks, RM390 for the semi-detached units and RM550 for the bungalows. Its neighbouring project is based on 15 sen per sq ft for superlinks and semi-detached units. Symphony Hills has yet to launch its bungalows. 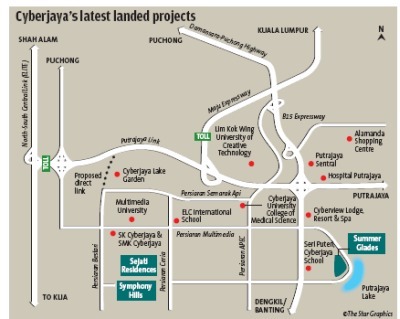 The master developer for Cyberjaya, Setia Haruman Sdn Bhd, was reported to be setting aside RM2.5bil over the next five years to develop four projects and build additional infrastructure for the area. It was also reported that one of the main issues brought up by developers there is the lack of public transport. Although there are major highways linking Cyberjaya to Kuala Lumpur, the perception of distance and connectivity is very real. KUALA LUMPUR: Fraser & Neave Holdings Bhd (F&N) plans to undertake a mixed development project with a gross development value of RM1.6 billion in Petaling Jaya, Selangor, its chief executive officer Datuk Ng Jui Sia says. The seven-year project is part of the company's effort to unlock existing land value, which will start in the second half of next year, he said at an analyst and media briefing on F&N's results for fiscal year ended September 30 2012 here yesterday. "The first phase of the project is still at the application stage and will cost RM500 million for the construction of apartment units," Ng said. F&N posted revenue of RM3.24 billion in its 2012 financial year, a 17 per cent drop from the number recorded in the corresponding year. The lower revenue was mainly attributed to the cessation of the Coca-Cola business, flood disruption in Thailand and absence of property sales. Ng said F&N will launch the new 100Plus Edge in the next two weeks and dairy products next year to maintain the growth momentum of the segment. An article that I read recently reminded me of the importance of always identifying and solving the root cause of a problem in order to achieve the desired result. It was about a country which had faced water shortages for years despite the fact that the country gets ample amount of rain. More and more water reservoirs were planned but the desired result was not achieved. Upon close scrutiny, the root cause of the water shortages was due to leakages from faulty pipe lines. In some areas, water lost through leakages was as high as 40%. Imagine if the problem of water leakages could be addressed as a top priority instead of building more reservoirs, the water shortages that had plight the country would have been reduced very affordably and significantly. The article reminded me of the issue of affordable homes in Malaysia. Based on recently published statistics from National Property Information Centre (NAPIC), the total residential homes in Malaysia as at the second quarter of 2012 was 4.58 million. Low-cost houses and flats account for 23% (1.05 million) or nearly one in four of the total residential units. About the same percentage also applies as well in Kuala Lumpur and Selangor. The debate still goes on whether the number of low cost houses and flats is sufficient but there is no doubt that there is a huge demand in the market for such units. Many qualified applicants have commented that it is difficult to find a low cost housing unit to rent. According to a recent report in The Star, thousands of government housing units in Kuala Lumpur were being sub-let to third parties by irresponsible tenants at five times above the control rental price. The same report also stated that the number of applicants for low-cost units in Kuala Lumpur had reached 26,000 and many of them had been on the waiting list for over a decade. Questions are being raised. Are these low-cost units occupied by the right group of people? Why are the owners or tenants renting out their units? Does it mean that they own or rent other such units as well? Should we focus on repairing the allocation system before building more homes if there is so much leakage? For a long time, I have heard that many quarters have been sceptical about the process involved in the allocation of low-cost units. Now that the Government is scaling up its effort to build more affordable homes, this is a good time to immediately carry out an exercise to review and ascertain whether or not the allocation and implementation system has any leakages. Building additional units will never be sufficient to meet the demand if these leakages continue to exist. To ensure that the review is carried out without interruptions or biases, the review panel should consist of both the authorities and NGOs. The process of receiving and filtering the applications, the filtering criteria and the final determination of the allocation would be the specific areas to review meticulously to ensure controls are in place and no abuses creep in. Based on the principle that low-cost housing units are meant to provide shelter to low income earners, it is essential to ensure that there is a transparent and comprehensive mechanism to determine qualified owners as well as to ensure that no one can own more than one low-cost house. As part of the review, some commendable practices in other countries should be considered for adoption. For example, the Singapore HDB (Housing and Development Board) flat owners-to-be are not allowed to own any other properties in Singapore or in any other parts of the world. For HDB flat owners who wish to sublet their flats, they must meet the minimum occupation period (depending on purchase mode and flat type) and obtain HDB's approval before they can sublet their units. In Hong Kong, to qualify for a Housing Board flat, one must not already own a house or flat, and it must only be for own use. In London, the right to buy a council home comes with several conditions. For example, the applicants have to hold a public sector tenancy for five years, and the property that they wish to purchase must be their only home and is for owner occupation. To implement a more effective housing allocation system, we may want to consider applying similar measures to deter owners or tenants from the blatant abuse of public and low cost housing units for rental yields. Low cost housing is a significant subset of affordable housing. If the review confirms that there are leakages within the allocation system that have allowed “abusers” to choke the market for low cost units, the government and relevant stakeholders ought to immediately work out a solution to fix these leakages. Water and homes are the key basic necessities of life for everyone. Imagine yourself living in an environment where it is difficult to get these necessities and then to find out later that if proper diagnosis had been made, the problem would have been reduced tremendously. The key is: “Do it once, do it right”. The solution can be as easy as fixing the water leakages rather than building more reservoirs. FIABCI Asia-Pacific regional secretariat chairman Datuk Alan Tong has over 50 years of experience in property development. He is also the group chairman of Bukit Kiara Properties. For feedback, please email feedback@fiabci-asiapacific.com. Is it a good time to prepare a war chest? In such volatile times, what should people invest in? What will the next six months, or one year, hold? The last couple of weeks, two developers suggested it may be a good time, or a good idea, to prepare a war chest. That means, liquidate some assets and get ready some cash. There may be something worthwhile to pick up in the next six months, they said. Soon after that conversation, a real estate professional help to put the pieces of puzzle together. Barack Obama has retained his presidency. That means status quo in the United States, recovery will be fragile. Spain may need a bailout. Eurozone may plummet further. In October, Hong Kong joined Singapore in efforts to cool soaring property prices by targeting non-residents. The Singapore and Hong Kong property markets are two of the most robust in Asia. Foreign funds like both these markets. Let us come back to our local property market. Two real estate professionals say the secondary property market, which one buys from owners and not from developers, has been slow the last six months. Some say it is good that the market is taking a breather. Others say it is a sign of the times. The valuer says a weak secondary mortgage market is an indication that there are weaknesses in the overall property market. The new launches, however, remain attractive partly because of the various freebies and developer's interest-bearing schemes. The primary market, where one buys from the developer, remains strong because under the interest-bearing schemes other than a 10% downpayment, they do not need to pay until the project is complete, she reasons. Under construction properties have higher risk than completed ones. Hong Kong and Singapore have put in place measures to deter purchases by non-residents because the third round of quantitative easing (QE3) by the US has induced a flight to risky assets and he considers property as one of them. That seems to go against the grain of what many think today. The last couple of years, one of the reasons for the rise in property prices was because real estate was considered as “safe” and a good hedge against inflation. The safe assets, he says, are inflation indexed bonds, treasury bonds and government securities. The flight to the East to risky assets and to properties is a signal for all of us to take note. This was confirmed by an economist who says when the flight reverses, the situation will be severe. Malaysia seems to be chugging along well. Will Malaysia be able to withstand the onslaught, notwithstanding “the good news”, “feel good” factors today? Properties look attractive because of the economic conditions around the world and because of the threat of looming inflation on the horizon. Property being a good hedge is a perception, the property professional says. This flight to Hong Kong and Singapore may happen in a bigger scale in the next six months to one year, he says. That is what both Singapore and Hong Kong governments are trying to stem out. This flight to the East may create, grow and burst bubbles. Some of that money have slipped into Malaysia and it is up to regulators to keep an eye on the situation. The solution is to create investment avenues. This is not easy for governments to do and it takes time. Why create that war chest then if there is so much risk and volatility floating around? The days of long-term investments are over. To be wise in today's volatile times, one may have to be a trader, or a sort of trader. Have a basket of goods, and hopefully one balances out the other. The holiday season is around the corner. A new year is about to begin. The investing template, like the investment climate, has changed. Deputy editor Thean Lee Cheng wonders if our finanacial planning professionals are reading the signals. KUALA LUMPUR: IGB Corp Bhd has entered into two conditional shareholders agreements with Selia Pantai Sdn Bhd for the establishment of two joint ventures through equity participation of 70:30 basis each in Southkey Megamall Sdn Bhd and Dimensi Magnitud Sdn Bhd. In a statement to Bursa Malaysia yesterday, it said that the JV was to acquire and develop the three vacant parcels of leasehold land situated in Plentong, Johor into a retail mall and/or mixed development as may be approved by the authorities.